Frugal Gardening – How to Get Plants for Free! It’s a fact of life that these economic times mean we need to find ways to save money everywhere! 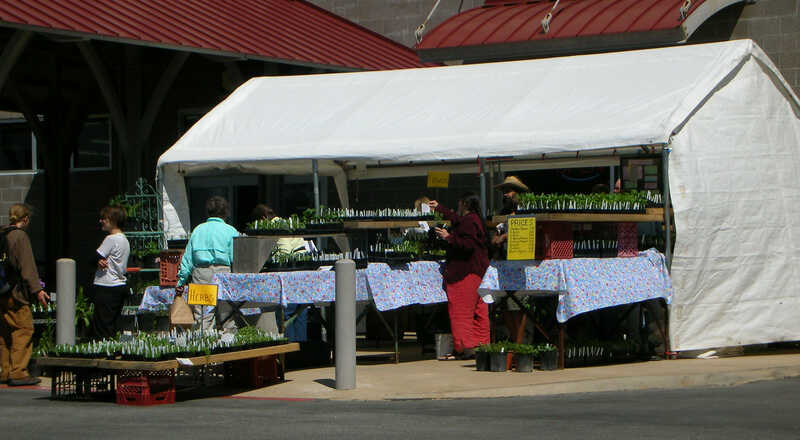 You can get seedlings and plants cheap or even free if you know where to look! 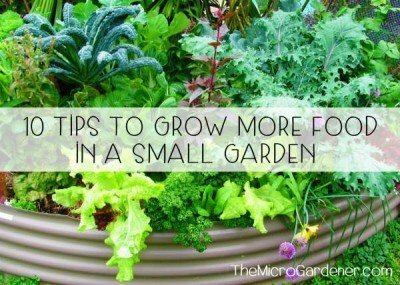 Savvy gardeners are always looking for clever ways to be thrifty in the garden as well as learn from others who are willing to share their knowledge. Experienced gardeners often have the best tips of all and will save you wasting money in the garden making unnecessary mistakes. Learning some simple techniques, sharing and swapping with others and taking advantage of nature’s abundance are just some of the strategies in a frugal gardener’s toolbox! If you are thinking of adding a fruit tree or two, some edible veggies and herbs or potted colour, buying all these at retail prices will obviously add up very quickly. If you want decorative pots or containers for them all to go in, then you might need deep pockets! Once you have all these wonderful species growing, do you have the knowledge to care for them all so they yield you the maximum harvest? 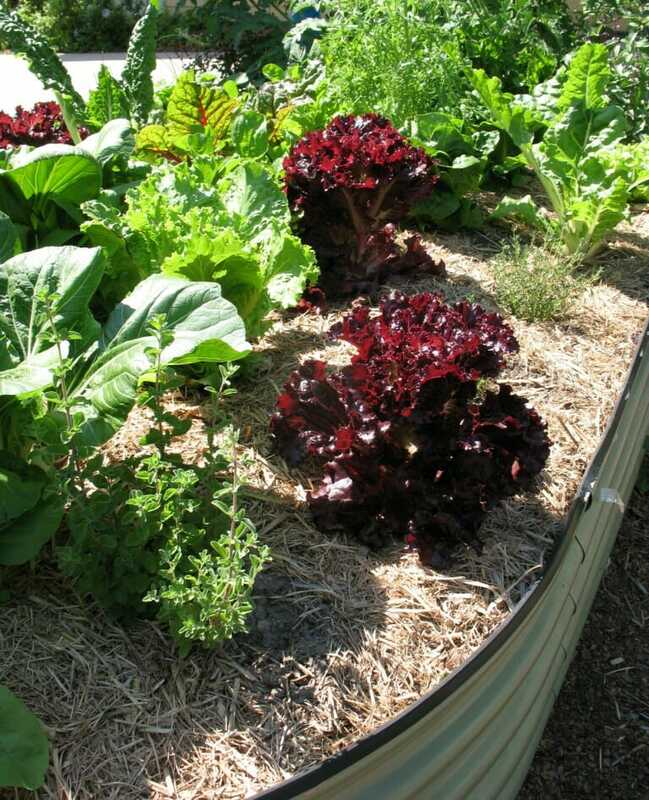 Money spent wisely in the garden will actually SAVE you dollars off your weekly food bill as well as build your health so you spend less on medical expenses. I’ve managed to cut what we spend on fresh fruit and veggies quite considerably since we started growing edible gardens in pots and just a small space. Not only that but I’ve done some detective work to sniff out where you can get the best bargains on plants and best of all how to get them for free! Because we renovated and landscaped properties for a few years, often by the time it got to shopping for the plants to finish the garden, the budget wouldn’t stretch as far as we hoped. So, with a bit of creative thinking and help from others, I learned some smart ways to grow a garden dirt cheap! Having developed a ‘treasure chest’ of ways to add a diverse range of plants without spending a fortune, I’d like to share these tips with you and best of all, most of them won’t cost you a cent! 1. Beg, Borrow (but don’t steal! ): Asking friends, neighbours, family or work colleagues (particularly those who are keen gardeners) for any plant cuttings, extra plants they don’t need or seeds they may have is one of the easiest ways to grow your garden for free. 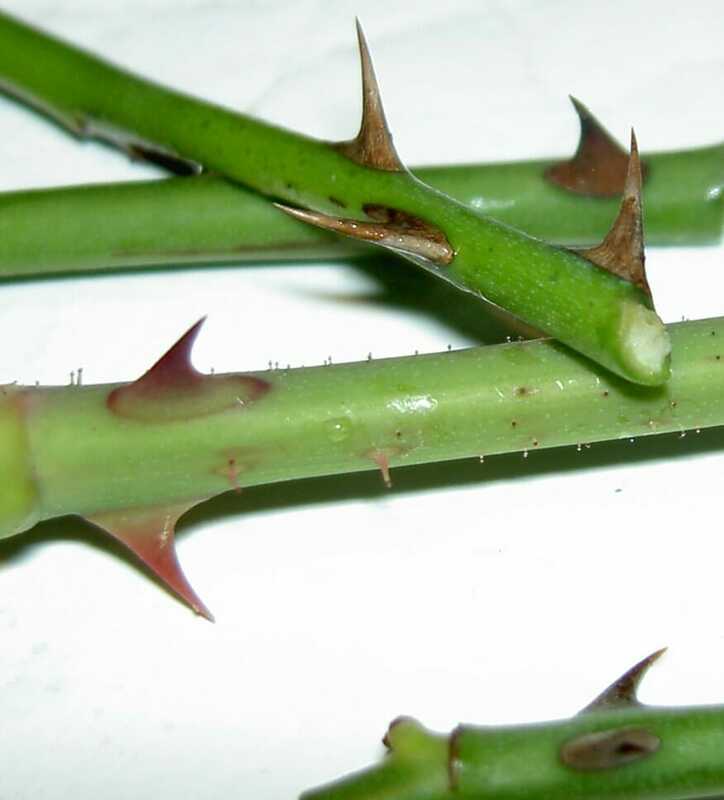 Pruning, dividing and removing plants that have gone to seed are regular maintenance activities for many gardeners each season. 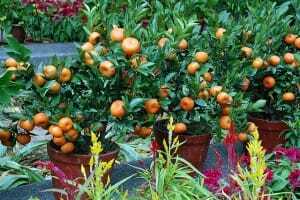 These are also prime times to add to yourgarden from what is often plant material that will go to waste in someone else’s garden. Next time you see your neighbour doing some gardening, have a chat over the fence and ask if there’s anything they want to get rid of. Offer to swap or share something from your garden or kitchen in return. If you’re good in the kitchen, invite them over for a cuppa or something home baked. Bribery works wonders! Offer to help dig up plants that are ready to be divided (e.g. herbs like chives, lemon balm, lime balm, comfrey, all mints, oregano, thyme, tarragon, majoram, lovage, catmint, bergamot and lemongrass) and get some free plants in return. Think ‘win-win’! Many retirees and keen gardeners enjoy the company of their neighbours asking advice and willingly share cuttings or seeds too. Some examples of herbs that reproduce from cuttings include: basils, rosemary, sage, mint, thyme, lemon and lime verbena, lavender, bay tree, geraniums, hyssop and wormwood. 2. Join a Group to benefit from freebies: Priceless gardening ‘know-how’ and plant materials are available in all communities if you just know where to look. 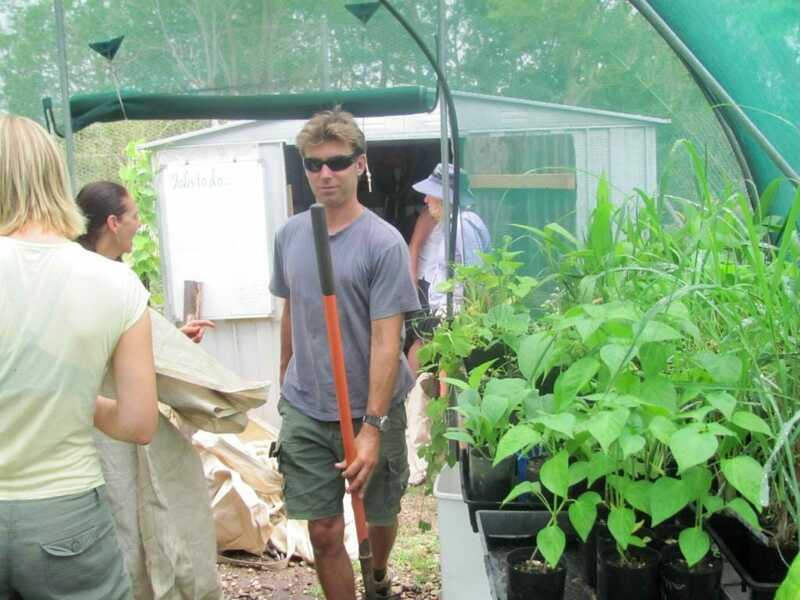 Volunteer at your local school garden, native land care organisation, community garden working bee or Permaculture blitz on a member’s garden. Not only will you provide an extra pair of hands and a much needed community service, but you will soon pick up loads of excellent free gardening tips and advice as well as often getting free plant cuttings as a thank you. Local gardening clubs, seed saver groups and Permaculture groups are always welcoming new members, sharing knowledge and plants. 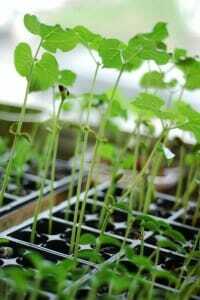 Save a few organic* sweet potatoes or potatoes, wait until ‘eyes’ or mini shoots sprout and then replant. (* Many potatoes are chemically treated to stop sprouting). 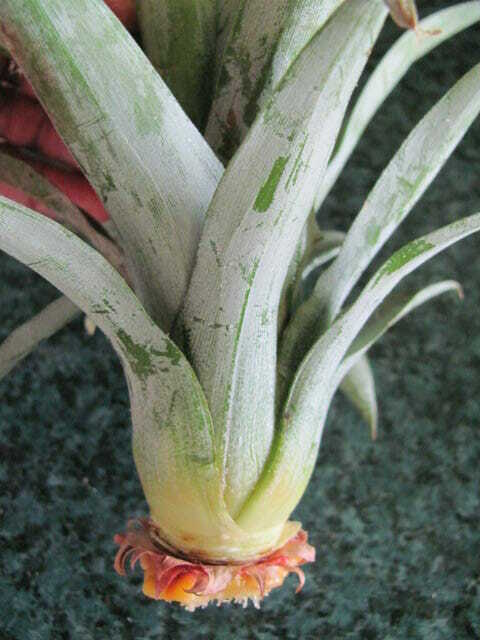 Twist the top off a pineapple, remove a few leaves from the base, until you see small brown hard ‘dots’ or ‘rootlets’ appear, then dry it out for a few days and replant it – roots will develop and in time, a new pineapple plant will grow. Make sure you water it well, add some organic slow release fertiliser and water in seaweed every fortnight until it is established. 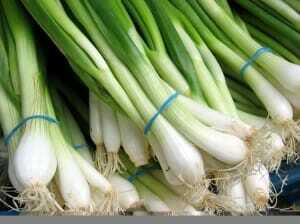 Take a bulb of garlic and separate the cloves – these can be individually planted and yield many new bulbs. When buying leeks, select those that have the roots left (many have). 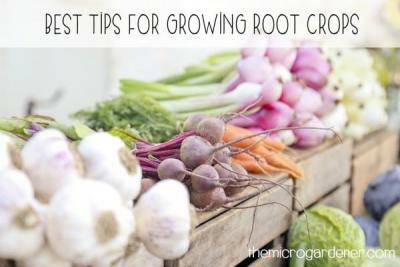 Soak the roots in water overnight and then plant them deeply, making sure to build up a little hill around the base. Put a stake in to keep the plant stable and watch the leek grow again. When it goes to seed, save these and you will have more leeks again for free! 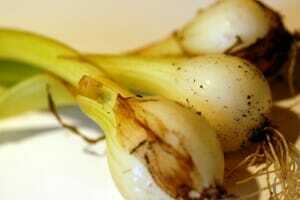 Have you ever bought a bunch of shallots or spring onions, only to find they are still in the fridge days later and they are going waste? Rather than ending up in your bin, shallots and spring onions that still have their roots attached can be grown by burying these in some compost leaving the tip just below the surface. I’ve done this so many times I’ve had far more than I need now in my garden. More plants for free! Not only that, but as you pick the stems from the outside, these great value tasty plants will re-grow again in the centre so you can continue to harvest. 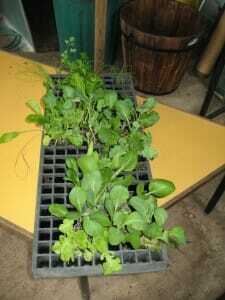 Beetroots if bought fresh can often be replanted again. Take the whole beetroot and plant with the leaf end upwards and the pointy bit down. It will start to both grow new shoots and eventually go to seed so you can start the cycle again. Remember beetroot leaves are a wonderful addition to salads although in moderation as they do contain oxalic acid. These leafy greens are full of vitamins, add colour and you can keep picking leaves until you are ready to harvest your root crop. Organic Celery will regrow if cut above the base of the stalks. 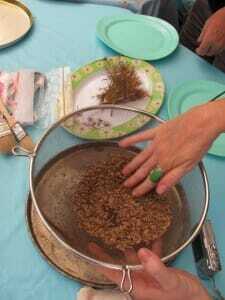 Add to warm water in a shallow dish for a few days till roots appear and then plant out in moist rich soil. Mulch and water well until leaves appear. 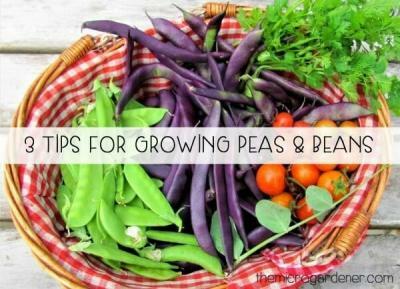 Fresh peas are another veggie you can buy from your market or grocer and grow from seed. 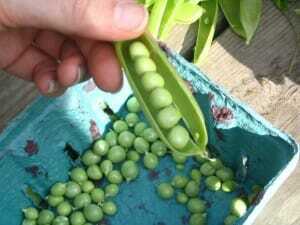 The seeds need to be ripe enough to germinate so check if the peas in the pod are large and swollen. 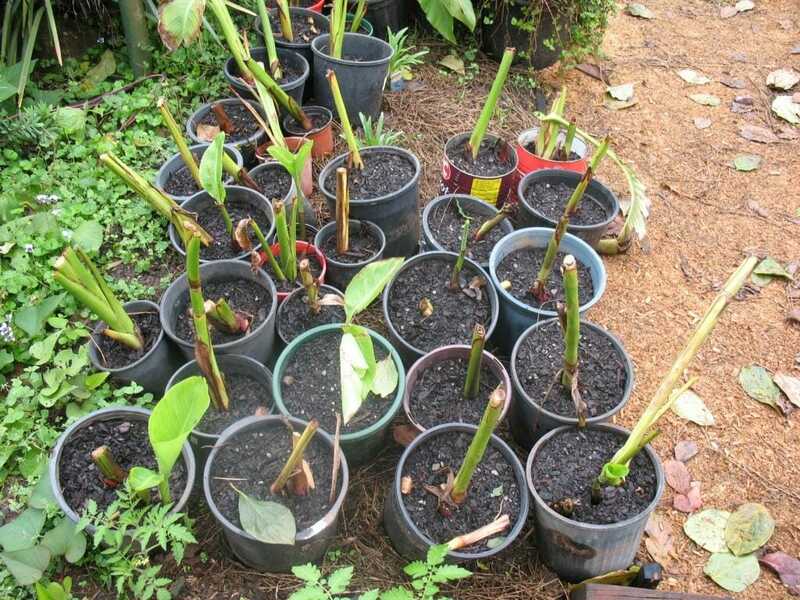 Plant them right away or save them for later planting by drying them out well. 4. 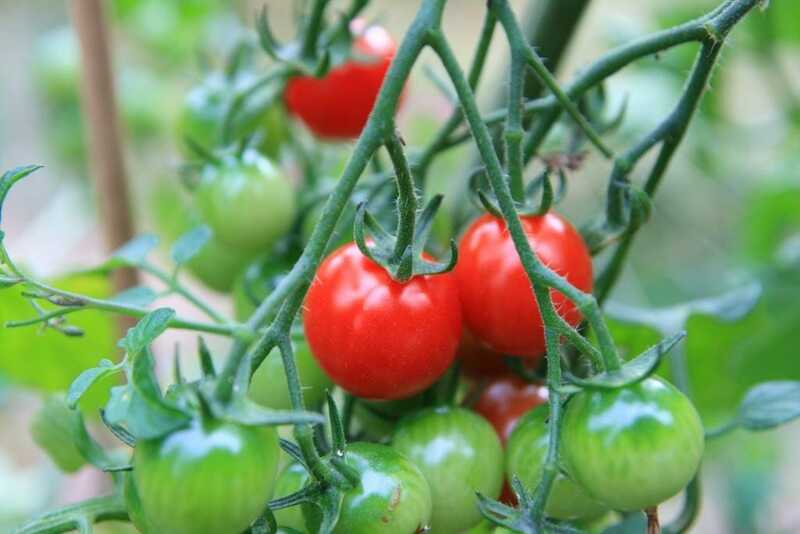 Save Seeds: It’s quick and cheap to save some seeds from easy to grow herbs like dill, basil and rocket, or veggies like tomatoes and pumpkin which will more than reward you for your efforts. 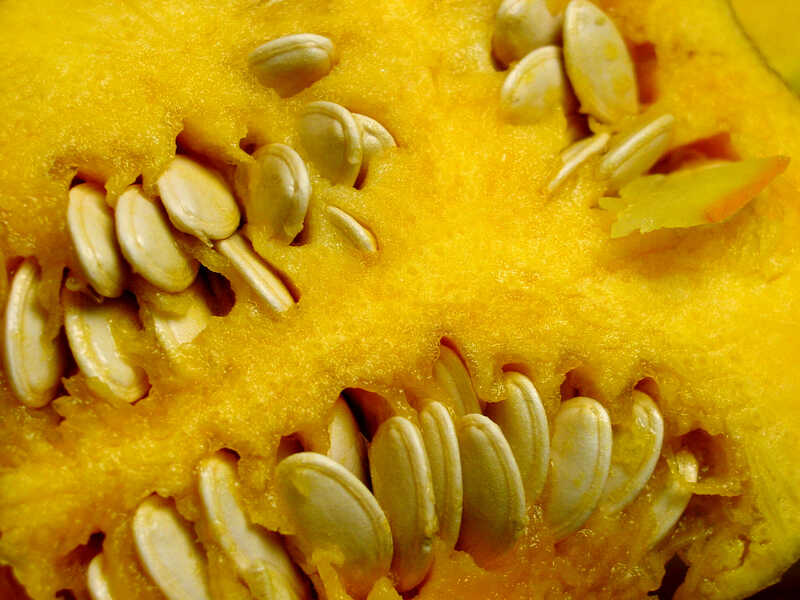 One plant or fruit has more seeds than you will need to use at once or most likely that whole season or year! Nature is extremely generous and prolific! There are both wet and dry seed saving techniques but these processes are easy to learn. 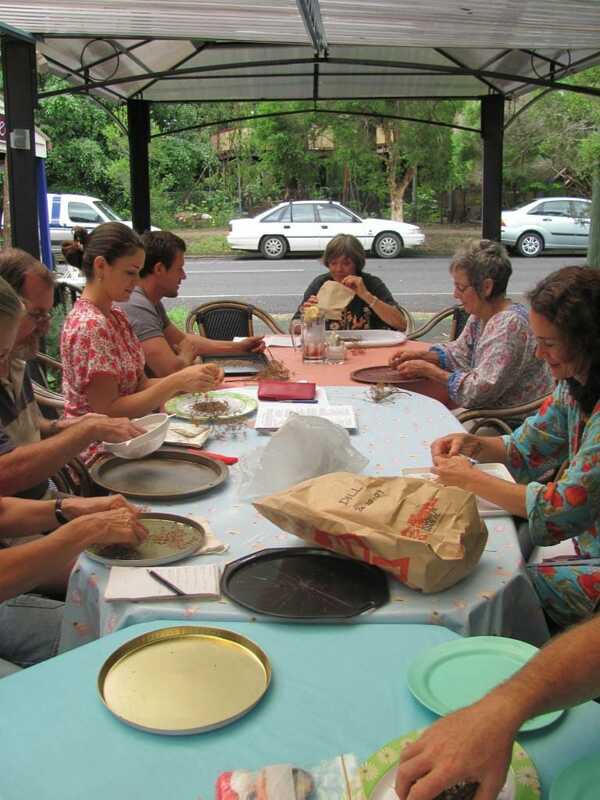 As the co-ordinator for Eudlo Seed Savers group here on the Sunshine Coast, I enjoy helping people learn how to save all kinds of seeds and share information about what grows well in the local climate. The best seeds to save are from heirloom (traditional or local varieties that have been grown in a region for a long time), organic (not chemically treated as many commercial packet varieties are – so you will have to keep buying more! ), ‘open-pollinated’ varieties of some cross-pollinating crops (like cucumbers, carrots and capsicums) and self-pollinating crops like beans and peas. If you have excess seeds (more than you need) or more seedlings have germinated successfully than you can realistically plant, another thrifty tip is to share or swap your surplus. In my case, I often have loads of extra herb seeds like dill, rocket, basil and chives so it makes sense to share these around. Small seeds don’t last as long as larger ones like peas and beans too so it’s best not to hoard, but to share and plant! Tomatoes are always self-seeding and popping up everywhere so I have more than I will ever eat, cook, freeze or dehydrate (semi-dry). Healthy seeds and seedlings are shared with our local seed ‘bank’ and swapped for other varieties that I then add to my garden. 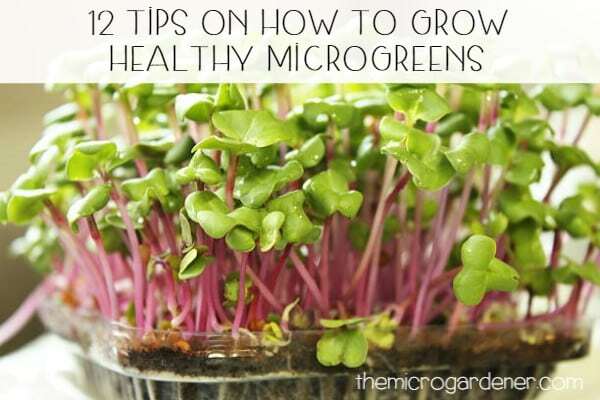 This saves me buying a new packet of seeds or seedlings too, so it’s a ‘win-win’ for everyone. Self Sown ‘Volunteer’ Plants – According to Wikipedia’s definition, “a volunteer is a plant that grows on its own, rather than being deliberately planted by a human farmer or gardener. Volunteers often grow from seeds that float in on the wind, are dropped by birds, or are inadvertently mixed into compost before it is used. Unlike weeds, which are unwanted plants, a volunteer may be encouraged once it appears, being watered, fertilized, or otherwise cared for.” Nature is generous and without a doubt you will find over time all sorts of plants popping up in your garden that you didn’t plant! Even in small pots! How many times have you seen a tomato seedling appear miraculously from nowhere? These seeds may have already been present in the soil or compost, brought in by birds or animals or just general gardening. If you use ‘cold’ compost that hasn’t fully broken down or reached temperatures high enough to kill seeds, then you will no doubt have plenty of volunteer plants deciding to grow at your place! If they are a weed or plant I don’t want to grow, sometimes I give them away, swap them or compost them. But if they are one of nature’s freebies, well I say ‘Thanks!’ and give them the usual TLC that my regular plants get! Even if you don’t have a green thumb as a gardener, these free self-sowing plants will at least do some of the work for you and if they are edible, generously feed you as well! Garage & Car-Boot Sales – When people are selling their home, they often don’t realise just how much they’ve accumulated. By the time they get a quote for moving all those heavy pot plants, they often re-think what stays and what goes! 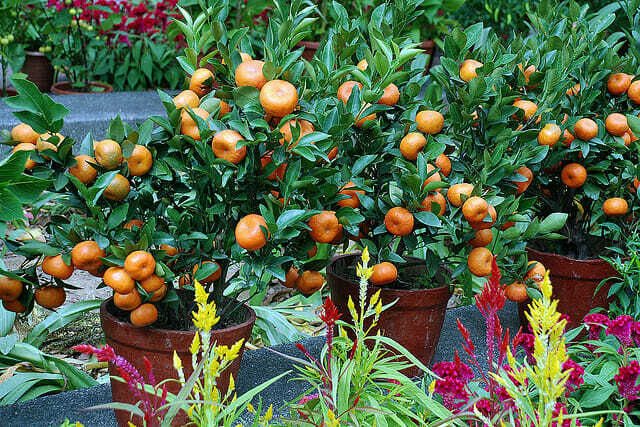 From personal experience, large heavy potted plants can cost a lot to move. Garage and car-boot sales are wonderful sources of cheap and often healthy, mature plants being offered at a fraction of the cost for the same sized plant new. Check the ads in local weekend papers that list whether plants will be available at the garage sale. You can often phone and ask what they have before rocking up or just take a morning drive and see what treasures you can find! Local markets – These are great places to buy direct from growers and stallholders who are selling plants at a fraction of the cost of retail prices. Some stalls are manned by homeowners taking advantage of an alternative garage sale venue because they know they’ll get more people coming along. I’ve picked up great tube stock, natives, ornamentals, flowers, herbs and veggie seedlings from markets and it gives you an opportunity to talk to the grower face-to-face at the same time. You can pick up lots of free “how to grow” tips while you’re there. If you are local to the Sunshine Coast, take time out to visit the Yandina Plant and Produce Market on Saturday mornings from 6am-12nn at the Yandina Sports Ground, North Street, Yandina. It’s renowned as the largest plant market on the coast and you’re sure to bag a bargain. Check the ads under the “Garden” section too for bargains and freebies. 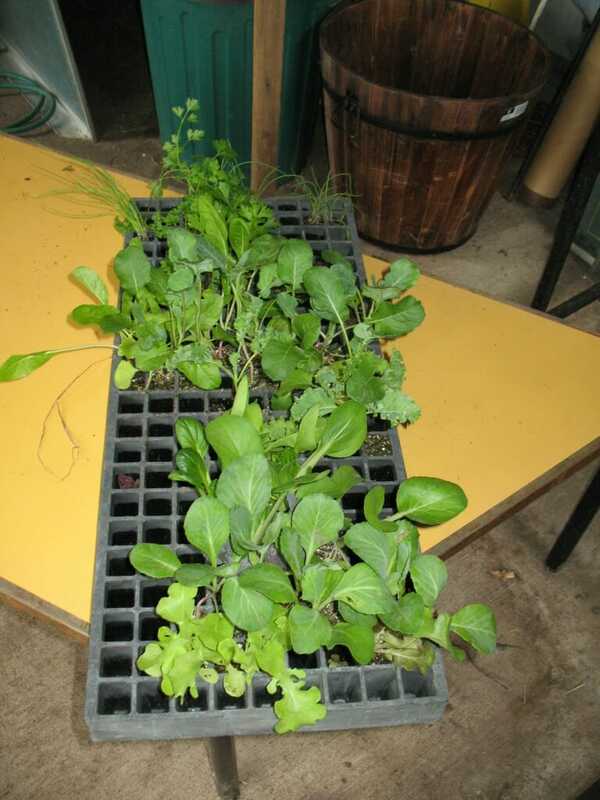 Volunteer for Native Landcare groups & Nurseries – If you are willing to volunteer your time to both learn and help propagate local species via your nearest Landcare group, Community Garden or Nursery, you will no doubt pick up free seeds or cheap seedlings to take home too. There is a wealth of knowledge and growing information available through such nursery groups and even private businesses who can always do with an extra helping hand so even if you can only volunteer for a short time, it’s a ‘win-win’ scenario. 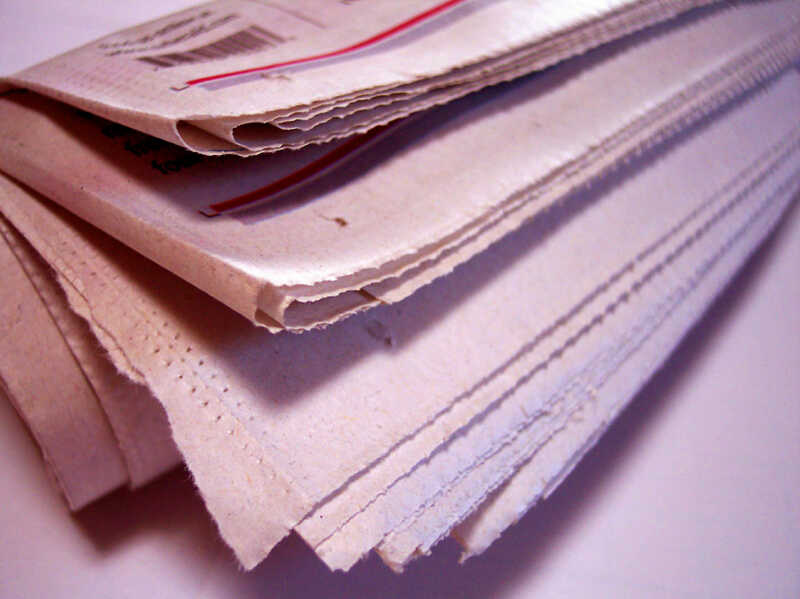 Wanted Ads – Post a ‘Wanted’ ad in your local newspaper, asking for free plants to start your veggie garden. 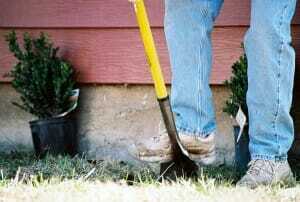 Most gardeners love to help others out when they have excess in their own garden. (If you have some plants already, this is a great place to offer to trade plants). Another free site you can request free plants is on FreeCycle. Retail Clearance Racks– Large retail chains with garden sections almost always have an area where they have plants marked down for sale. This may be due to their slightly less saleable appearance, being pot bound or a genuine clearance of overstocked plants. Or, they may have new season plants arriving and need to clear the room. Whatever the reason, you can often pick up a bargain especially if you are prepared to give a little TLC at home to a plant that is looking a little droopy or under the weather. A good drink of seaweed/kelp is a brilliant ‘pick me up’ tonic and is often all that’s needed to perk up your new bargain. Free Plants from Council – Most councils offer residents a couple of free native plants each year if you bring your rates notice in on specified dates in the calendar. There is usually a good range of plants available and this is one great offer to take advantage of to build your garden for free! 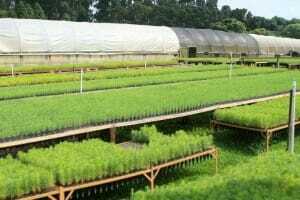 Buy from Wholesale Nurseries – There are more and more wholesale nurseries selling direct to the public and a lot of plants are available to purchase online via catalogues. While you don’t get to touch and see before you buy, the prices may make it worth your while. Ask for a Discount for Bulk Plants – If you need to buy bulk plants e.g. for a landscape project such as a hedge or ground cover; are part of a group project such as a school or community garden; or just getting together with neighbours who all want to buy the same plants for much cheaper, then make sure you ASK for a discount. 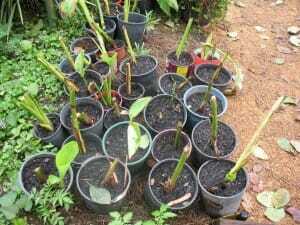 Most nurseries will give you a discount for buying a set minimum number of plants. Find out what that is. I have also saved heaps by buying smaller plants (that grow just as fast but don’t hurt the budget so much) and by simply finding out how many we needed to buy to get the discount. The money you save, you have available to spend on something else. Well, those are my top ideas for getting plants for free and picking up some bargains. What are your tips? How have you saved money in the garden? I’d love you to share your ideas here too. For more Frugal Gardening tips, check out these thrifty ideas to make your own garden toolbox out of recycled materials – Containers, Seed raisers, Labels, Watering Cans and Sprayers. If you don’t want to miss future posts, subscribe to my newsletter (and grab your free eBook) or click on the RSS feed below or to the right. Can volunteer in my farm,I wanna change it to a flowering n fruitful amazing garden ,with birds singing ,bi have enough water n good soil there…can u pls come to india n volunteer, i can take care of ur accomodation, food, local guide as i stay in Ajanta, and also for good quality herb!! I love gardening. Thank you for these tips. I am so happy to read your article on planting. Please add me to your e-mail address to get more planting ideas. “Tomatoes are always self-seeding and popping up” I’ve only had one (seed) that I thought was an accidental plant that was a mistake. Am I missing some thing that will help re-seed my tomatoes? Do they need to be Heirloom tomatoes? Hi Lon, I am not sure which climate zone or country you garden in, so this may possibly play a role in how suitable the growing season is. However, I only use heirloom or organic tomato seeds to start with and that may be your problem. I also take some tomatoes from healthy plants and toss them in the compost or into pots and allow them to germinate when ready. I also allow my edibles to flower and set seed. Then I either collect and save them or allow them to be wind blown around the garden and find their own new spot to self sow. I have to dig quite a few lettuce seedlings out of our lawn today as they have taken root in a nice moist semi-shaded spot and I just have to transplant them to a more convenient location. I didn’t have to do anything up till now. There are many hybrid tomatoes on the market (plant breeders and horticulturalists often like it this way so they can make more money)! Hybrid seeds (e.g. 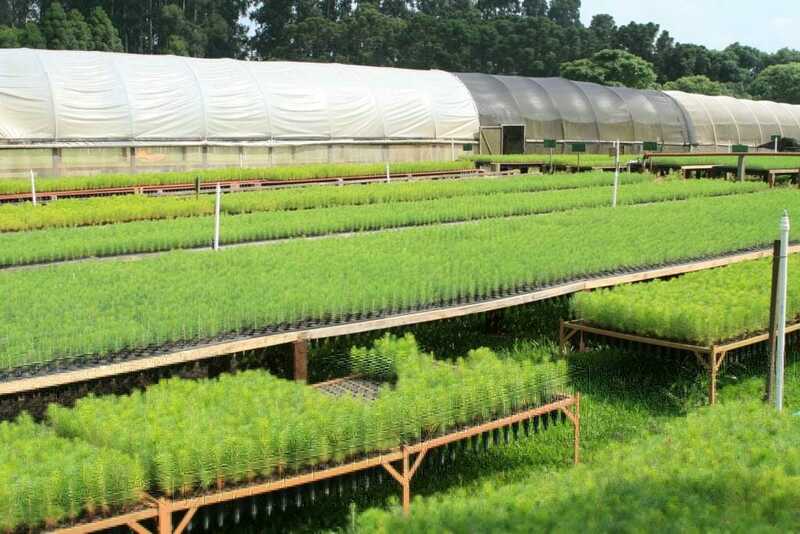 F1) are also more expensive than heirloom and cert organic because the plant breeders have spent time combining 2 parent plants to obtain one with certain characteristics. However, there are always compromises when you mess with nature. These hybrid tomatoes will NOT grow true-to-type. i.e. if they do self-sow, you won’t get the same plant you grew before, because it is a combination of two plants. Whilst there is some level of diversity in non-hybrid seeds, you can be confident you are getting the same plant each time. You can also grow heirloom tomatoes by taking cuttings off the parent plant and then it will be a clone (identical). 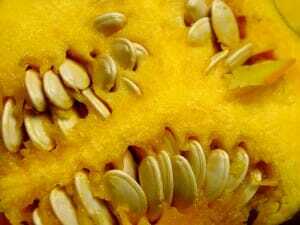 You can read more about different kinds of seeds in my article on Saving and Sourcing Open-Pollinated Seeds. If you want a truly resilient garden – one that will grow on its own with safe food to eat – I always recomment you start with certified organic or heirloom seeds. 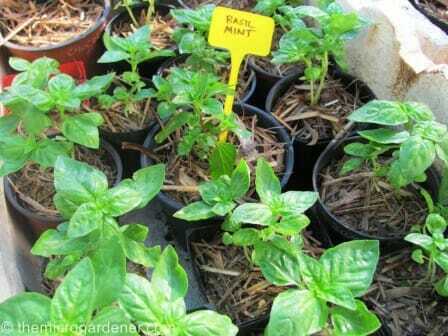 Then you can save money by saving seeds from these and they will self-sow in your garden more readily. Why? Because they have adapted to your micro climate and soil conditions. 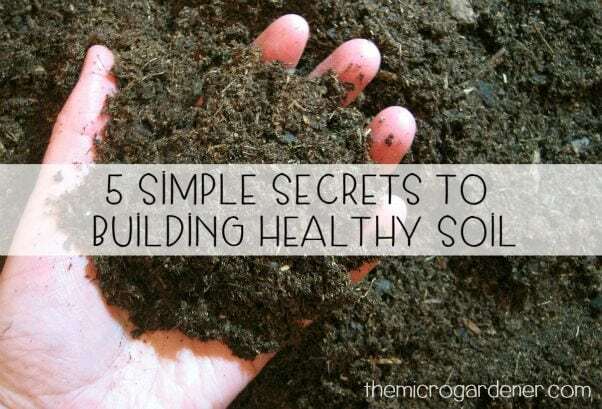 It may take a while, but if you build your soil and keep it moist (especially with mulch), you are likely to have much greater success. Saving seeds also enables you to grow your favourite foods and have food security for when seeds get too expensive to buy or become unavailable. Hope this helps. I have scanned through your article and it looks absolutely wonderful. So far I am very impressed with the layout and the wonderful pictures. Being a passionate gardener myself I think it is a great concept to introduce the younger generation into the magical world of gardening, especially when there is just so much you can grow yourself and so easily. I look forward to reading with interest your article in depth and would love to further comment. Stephanie Alexander would be very proud of you I am sure. My Granddaughter(aged 9) made home made pizzas at school using ingredients from the veggie patch, and then of course they had lots of fun eating their pizzas. I think it makes it very special when they have done it all themselves and can see when they plant, water and watch the veggies grow, at the end they can create something delicious to eat. I am certain as I read your article I will learn so much that I can put into practice myself. Good luck I wish you all the very best, you a doing a wonderful thing, keep it up. Thanks so much for your positive and encouraging feedback! Glad the article is useful. I have a love of colour and photography and find so often a picture tells the story far better than I can! Whereabouts are you located? I have been involved with a school garden program here on the Sunshine Coast that got a grant from the Stephanie Alexander Kitchen Garden Foundation. They built a school kitchen as a result as well as a pizza oven and the gardens have expanded incredibly. I’ve had many wonderful experiences at that school where the students come outside one day a week for garden lessons and found in practice, those who had never really been exposed to gardening took a little patience before they found what they were most interested in – sometimes digging, planting, weeding, propagating and hard physical work, others enjoyed the insects and worm farm, some preferred getting creative making garden signs and garden art to signpost where to go, but they ALL enjoyed the harvest! When many of the students started coming over to the garden during their morning or lunch breaks and wanted to keep working, this was a clear indication of their genuine enjoyment and interest in nature’s classroom. The bonus is going off to the kitchen to prepare a mouthwatering cook up! I’d love to hear more about your experiences so feel free to share your own ideas, tips or stories or just tell me what you’d like to read more about. I have plenty more ideas on Frugal Gardening that I will be sharing as well as more on Gardens for Kids very soon. What a fantastic section Frugal Gardening is. Thanks heaps for widening my horizons and helping me so much. Thanks Rosemary – more ideas on the way soon for ways to save money on homemade fertilisers, pest management and more!